Amazing Adventures are always great HOG games. This series is one of the all time top three. The Caribbean Secret is no exception. Great HOG,great visuals and a challenge for all skill levels. This game is a buy! This is a straight-forward hidden object game, with moderately difficult scenes to complete, & fairly easy puzzles to solve to progress along in the adventure . . . 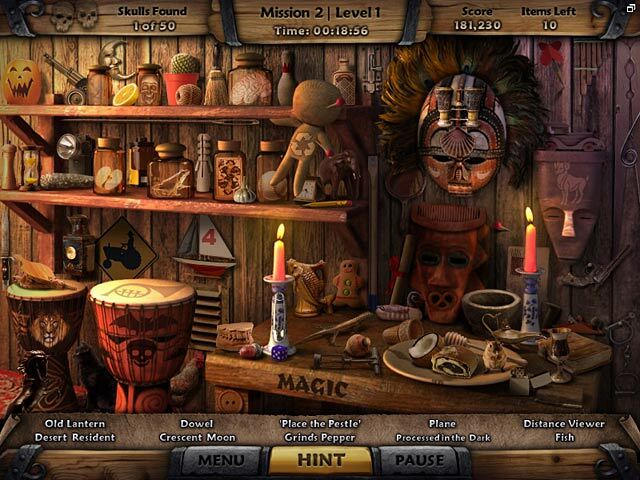 If you find all 50 skulls, you earn unlimited search in the hidden object scenes, & you get to play lots of match three rounds . . . The end puzzle is cool, & you can play this game timed or untimed . 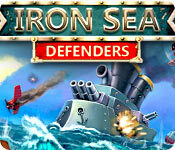 . . As a bonus, after completing each level, you get a fun fact about the Caribbean . . . ! This game has 25 levels and several locations within each level. For each location, there is a HOS to play and then immediately after a puzzle to complete. The puzzles include match 3, several variations of picture puzzles and word seeks. At the end of each level, you get a map piece for use at the end of the game. When you put all the pieces of the map together at the end of the game, you find the treasure. During the game, if you collect all 50 skulls, it opens the bonus play at the end of the game. I always enjoy this, as I get to go to every location and find every hidden object at that location. The bonus content also includes 25 match 3 puzzles. One of the things I really like about these games is the interesting facts about the location that are revealed at the end of each level. For instance, killer whales are actually dolphins. So the game is educational as well as fun. 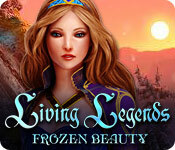 This is just a nice hidden object game, relaxing and fairly easy to play. Excellent for kids and beginners, as well as those of us who like to keep our hidden object skills sharp with lots of practice. Game was fun to play. Visited same places to find things too many times. Towards the end game was rather boring. Some objects were hard to find. Game was fun just a little long. I did love this game, but I hate giving reviews, so here's a combo pack: It's fun. Kitschy, fun, and challenging, so by all means if you love the genre - get it. So far it's the best I've tried. I've played the Mystery P.I.s and they all suffered from one BIG drawback: repetition. So does this. I didn't seem to mind so much because they upped the challenge a bit and, again, it was kitschy. Still, *especially* for the endgame I'd have LOVED some new content. (The bonus Match 3 was a faboo add-on too!) I would hope they'd learn from this. Some games are nigh unplayable due to this issue. I need long breaks from the Mystery P.I series, but this is one I played for hours. I'm getting into Vacation Quest: Hawaii now, and I see they've upped the challenges even more, building on these no doubt. Yes, there's repetition as well, but again better graphics and sweet, sweet kitsch factor. I see their constant improvement; I hope fresh content for their HOGs is on their list in the future. Until then I don't see anything going over 4 stars for me. I loved this game because it's challenging yet not frustrating! I don't like the games that have items hidden so hard that you have to resort to using a hint, or the games that don't explain what your next mission is. The puzzles to get to the next level are also fun & I think most people who enjoy this type of game will be very pleased, definitely on my" to buy list". i haven't met one of these i didn't like. the graphics are great. the HO scenes are not crowded. the game is looooong! you have 25 missions and 4 to 6 levels in each mission. you have to find 2 skulls per level and when you are done with each level you have a puzzle to solve but these are easy!!!! at the end of the missions you find out a fact about the caribbean. it does get tiring after awhile so i would plan to play a while and go back to it. i usually play until i am done and it gets monotonous. i should divide it up and play a little at a time. it is a great game just like all the other ones. very entertaining, puzzles, and HOGS! I have come to the conclusion that every Amazing Adventures is basically the same, therefor it is the theme of the game that makes or breaks it. This seek and find game has a Caribbean Sea nautical theme with many scenes taking place underwater, and I loved it! The museum has tasked us with locating a Spanish ship loaded with gold, that has been missing for over 300 years. 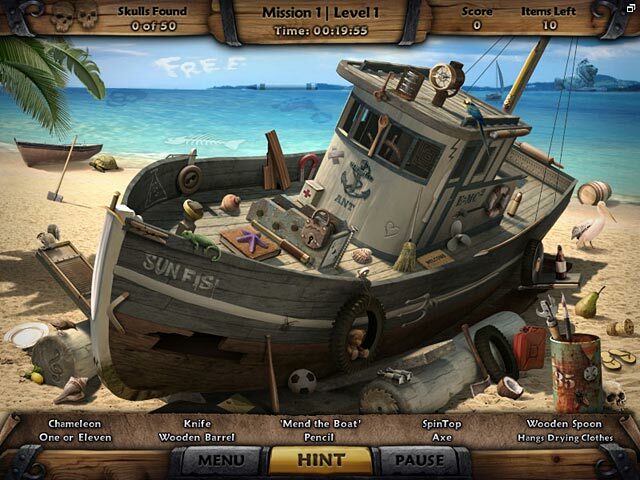 There are 25 missions to complete in areas such as an abandoned boat, the voodoo hut and even under the sea! 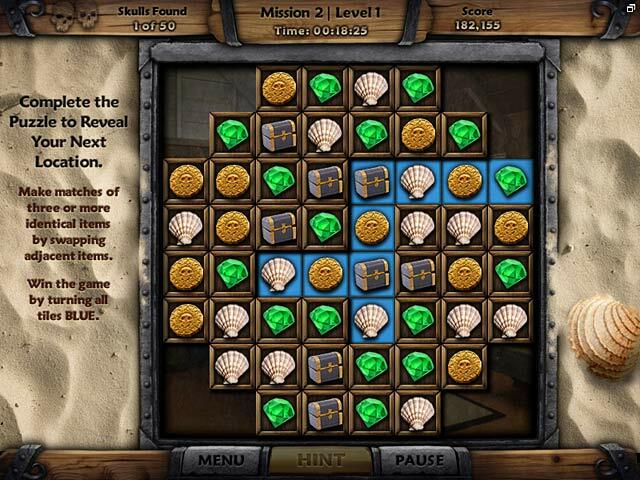 Each scene requires you to find two hidden skulls that aren't on the list and you must find all 50 skulls in order to unlock unlimited seek and find puzzles, and the bonus match 3 games. This game has a unique way of listing the search finds, some of the items are in a riddle type form such as distance viewers, meaning binoculars or telescope. After completing the HOS, you will need to complete a mini game to find out where the next location is. Some of the games require you to put items back into two almost identical side by side pictures until they are identical, others are match 3 games or even jigsaw puzzles. If you like a ton of seek and find items and relaxing mini games then this is the game for you, enjoy! Yea Man Am going to the Caribbean. Pop Cap make some of the best H.O games out there this is the kind of game i like it set as you can tell in the Caribbean just like the other games you have a list of item to find and mini games to play there knot too hard but this game is set on the fun factor thats what you get with pop cap games.as with the other games the graphics are dated but its still fun to play thats what counts in Pop Cap games.